[Author’s Note: I am putting this sermon online for posterity’s sake, as it is a sermon I preached about 10 years ago. However, I no longer believe that this text is intended to prove that Jesus is God. I do believe Jesus is God incarnate, but do not believe that this text proves it. At least, not directly. Who is Jesus? What is the most important fact about who Jesus is? If you could state one fact about Jesus that made Him who He was, what would it be? Most of the world would say something like, “He was a good man” or “He was a gifted teacher.” Those are true about Jesus, but they are by no means the most important thing about Him. He is much more than a good man or a gifted teacher. In some churches today, it has become popular to think of Christ as a social activist, or a political revolutionary. He is presented as a man who went about righting wrongs, feeding the hungry, healing the sick, uplifting the depressed. All of this He did against the customs of the day. His actions angered the political and religious ruling class of his day. This is true of Jesus also. But again, it is not even close to the most important thing about Jesus. Some Christians focus on Christ’s miracles. Some focus on his parables. Some focus on his prophetic teachings. All of these things are important, but none of them are the most important thing if we are going to know who Jesus is. Maybe we would say that Jesus is the Messiah. Jesus is the Savior. Jesus gives eternal life to those who believe in Him for it. Now, I would agree that these are the most important things that Jesus does. He saves people from the sins. He gives eternal life to people who believe in Him for it. What could be more important than that? But, these are things that Jesus does. What Jesus does is not who Jesus is. The questions was: What is the most important thing about who Jesus is? One of my favorite authors, C. S. Lewis, says that the most important thing about Jesus is that He is God. And that is exactly right. Those of you who have read Mere Christianity know what I am talking about. Lewis has that famous section in his book where he refutes the idea that Jesus was just a good man, or just a good teacher. He says that if this is all that Jesus was, then He was not a good man, or a good teacher. If Jesus was just human, the claims Jesus made about Himself would have made Him a liar or a lunatic. He must be God, or He is the biggest liar, the greatest madman and the most successful con-artist in all of history. Jesus cannot be just a good man. Jesus cannot be just a good teacher. Jesus cannot be just a social activist or a political revolutionary. Jesus cannot be just a healer or a prophet. He has to be God, or He is none of these things. What is the most important thing about who Jesus is? He is God. This is what Jesus sets out to show His disciples in Luke 5:17-26. Jesus has called some men to be His disciples, and He is teaching them how to become fishers of men. He is teaching them how to cast the line. He is teaching them how to bait the hook. He is teaching them what is most important in the life of a disciple. Last week, from Luke 5:17-16, we saw that if disciples are going to catch men, they must love all people, even those who are unlovable. Now, in Luke 5:17-26, we learn that once people are attracted to Jesus because of the love we show them, we need to make sure that they understand who Jesus is. He is not just a teacher. He is not just a good man. Jesus is God. The scene is set for us in Luke 5:17-19. Luke 5:17a. Now it happened on a certain day, as He was teaching, that there were Pharisees and teachers of the law sitting by, who had come out of every town of Galilee, Judea, and Jerusalem. The parallel account in Mark 2 tells us that there were not just Pharisees and teachers of the law present, but also a large crowd of people who had gathered to hear Jesus teach the Word of God (Mark 2:2). But along with this large crowd of people, there came these Pharisees and teachers of the law from every town of Galilee, Judea, and Jerusalem. Word of Christ’s ministry and miracles had spread, and the religious ruling class had heard rumors about Christ’s teachings and the way the crowds flocked to hear Him. So now these religious leaders are coming to hear Him for themselves in order to determine whether they should accept and encourage Him, or accuse and condemn Him. At this point, they have all gathered, not to learn from Him, but to pass judgment upon Him. They are legalistic-law keepers. They are heresy-hunters. In fact, the title Pharisee comes from the Hebrew word meaning “to divide, to separate.” They had developed a whole system of rules and regulations and laws for how they were to keep themselves separate from the world. Now, as with all legalism, it was impossible to keep all their rules, and they themselves were hypocrites and couldn’t keep their own laws (Matt 15:1-20; 23:1-36; Matthew 5-7). But one of the things they loved to do was go around and try to find people who were not living as the Pharisees thought they should, or who were teaching something contrary to Pharisaical teachings. Undoubtedly, that was why they had gathered to hear Jesus. They were professional sermon critics, and they were here to make a decision about Jesus. He has not been trained in their schools. He has not received their stamp of approval. And so now they have all come from Galilee, Judea and Jerusalem to determine who this Jesus is and what they should do about Him. Maybe you have the same questions about Jesus. Who is Jesus? What should I do with Jesus? These are the most important questions you can get answers for in your entire life. When you die and stand before God in heaven, the very first thing God will want to know is what you did with Jesus. Did you accept Him for who He was and what He said? Or did you reject Him? Did you believe in Him for eternal life, or did you trust in yourself and your own good works? Maybe you are like these religious leaders and you are trying to learn who Jesus is. Jesus is about to show you who He is. So watch and learn. Look at the next part of Luke 5:17. Luke 5:17b. And the power of the Lord was present to heal them. Luke, because he is a physician, is emphasizing the healing ministry of Jesus, whereas Mark 2 emphasizes the teaching ministry of Jesus. But remember, Jesus often did both. He taught the Word, and then He proved that what He was saying was true by performing miracles. In that time, this was how prophets showed that what they were teaching was true. So from this alone, the Pharisees and teachers of the law, and the surrounding crowd should have recognized that at the bare minimum, Jesus was a prophet of God. And many of them accepted Him as a prophet. In John 7:40, this is what the multitudes said of Him. That He was a prophet. But Jesus wants to show them that He is more than just a prophet. Before we see how Jesus does this, let me show you one last thing from Luke 5:17. Let me ask you a question. If you were trying to cram as many people as possible into the house in order to hear and see Jesus, would you have them stand, or have them sit? You would have them stand of course. A standing person takes up less room than a sitting person. But look at Luke 5:17! The Pharisees and teachers of the law were sitting! Why was this? Well, you must understand that in Jewish culture at that time, it was the teachers who sat, and the students who stood. Today, this is reversed. You go to school, and the students sit while the teacher stands. Even here in church. I am standing up here, you are sitting down there. But in Jewish culture, the teacher sat and the student stood. 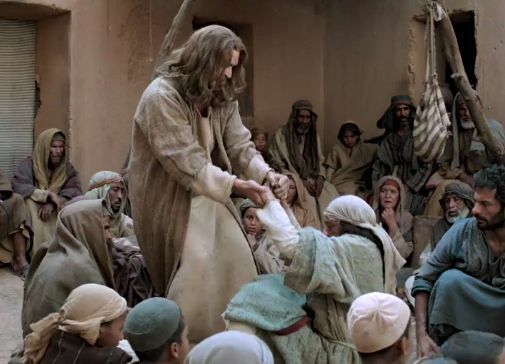 So the Pharisees and teachers of the law come to hear Jesus, but they don’t come to learn from Him. Oh no, they sit. Although more people could fit into the house if they stood, they will not stand, because they want to be in the position of authority. They want to appear like they are in control. They don’t want to learn. They want to teach. And so they sit. Do you see the scene? Jesus is sitting on one side of the room. The Pharisees are sitting on the other. They both are sitting. It’s kind of a “standoff” between the two, though in this instance, we could call it a “sitoff.” But then something happens which destroys all the dignity of the Pharisees. Something happens which gets them to stand up and scurry about like ants. It is actually very humorous to picture what happens next. I know all of you have read or heard this story before, but stop for a minute and imagine the scene. It is really quite comical. Look down at the end of Luke 5:26 real quick. After the events that happen here, all the people kept on saying to one another, “We have seen strange things today!” This was the craziest, most comical thing that had probably every happened in this town, and people couldn’t stop talking about it. Follow me into the house where Jesus was teaching that day. Try to imagine yourself standing there in the house, watching the events unfold. We don’t know whose house it is. It could have possibly been the home Jesus’ family (Mark 2:1). Maybe it belonged to Peter or one of the other disciples. Maybe it belonged to one of the religious rulers. Whoever it belonged to, Jesus was there teaching in the main room. The religious rulers, because of their positions of authority, were those who filled the house. They had come from all over Israel to hear what Jesus had to say, and so they were in the room with Jesus. They were all serious. They are sitting down. They had their Bibles open. There were worried frowns on some of their faces. This message Jesus was teaching could be dangerous if the people heard it. Many of them were visibly upset by the hoards of people who had gathered around. The house was packed full, and it was getting quite hot and stuffy inside. Someone had opened the windows to let air in, but all that happened was that soon the crowds were jostling to see and hear through the windows. But all of the religious leaders were very serious minded. Very dignified. Very authoritative. They are here to correct and teach Jesus if necessary. Who was this upstart, young man claiming to be a teacher of the Word? He was only 30 years old, but He had gained quite a following. They would have to put a leash on Him if they were going to control Him. He hadn’t actually said anything blasphemous yet, but He did have some dangerous teachings about the law and the grace of God. They were just getting ready to question and challenge Jesus on some of his ideas when they hear a bit of a disturbance in the crowd outside. Luke 5:18. Then behold, men brought on a bed a man who was paralyzed, whom they sought to bring in and lay before Him. Here are these men, carrying another man on a makeshift pallet through a standing-room-only crowd. It is causing quite a clamor. The Pharisees are having trouble hearing Jesus because of the ruckus. Some of them get visibly annoyed by the noise. They are trying to question Jesus. Why would somebody be so rude as to disrupt the proceedings? These men carrying the pallet don’t seem to even care that they are causing a disturbance. Mark 2 tells us that there wasn’t any room near the door, and probably all the windows were too crowded also. But then the men carrying the pallet see stairs leading up to the rooftop. Jewish homes often had these stairs on the outside of their homes. The roofs were flat so that people could go and sleep up there on hot nights if they wanted to. And so this is where the men with the pallet head. Luke 5:19. 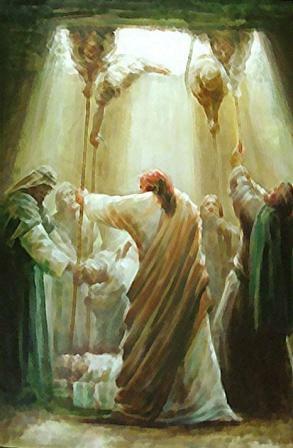 And when they could not find how they might bring him in, because of the crowd, they went up on the housetop and let him down with his bed through the tiling into the midst before Jesus. Luke just summarizes what happens here, but Mark goes into greater detail. Mark says they removed the roof and dug an opening. As I said, the roof was flat, and most likely made of timbers, covered with sticks and mud, and laid over with rock tile. So to get through, they lifted up the tile, then dug a hole through the sticks and dried mud. Finally, they get up on the roof, and there is all this scraping and pounding as they pull up the tiles of the roof and push them to the side. Jesus has stopped teaching, and is watching the scene unfold with interest and a bit of amusement himself. Then the pounding and digging begins, and all of a sudden, dirt and sand and twigs begin to drop out of the ceiling onto the Pharisees below. So far, they’ve been trying to remain dignified and calm. But now many of them jump up out of their seats, and angrily brush the dirt off their robes. The owner of the house is getting angry too. He is more concerned about the roof of his house than the dirt on your clothes. All the while, Jesus continues to sit there with a small smile on his face and a twinkle of amusement in his eyes. The men get their hole dug, and wonder of wonders, they lower the pallet through the hole in the roof. 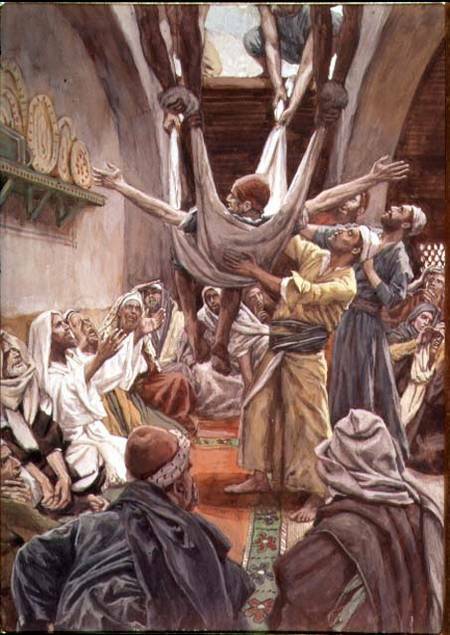 There is a man on the pallet who is paralyzed from the neck down, and several times, it looks like he is about to fall off the pallet, but he makes it safe to the floor of the room, right in front of Jesus. Everybody expects Jesus to heal the man, but Jesus does something else entirely. Something completely unexpected. Something entirely shocking. Jesus looks down at him, then up at the men peering through the hole in the roof. Do you believe that Jesus can help your friends and family members? Do you believe that Jesus is what they need? Although they may seem like they are doing okay most of the time, the truth is that they are paralyzed by sin, and they desperately need you to bring them to Jesus. In fact, I heard from one pastor who goes around the country teaching churches how to be more evangelistic, that on average, a non Christian needs to know at least four Christians in a certain church before they will agree to come to church. You see, most people do not like to go to a place where they don’t know anybody. This is especially true of non-Christians and bringing them to church. But if they know at least four other people at church, they are much more likely to come. This is why it is so important to develop relationships with non-Christians. Maybe they’ve been asked to come to church by someone else here, but they just don’t feel like they would be comfortable coming because they don’t know anybody. But if you befriend them, and then invite them to come, or better yet, bring them with you, they will not only know you, but also some other people here who invited them previously. I guarantee this is not what anybody expected to hear. This is not what anybody wanted to hear. The men on the roof were probably visibly disappointed. They brought the man to Jesus for healing, not to have his sins forgiven. The man on the pallet is crushed also. He wanted to be healed, not to have his sins forgiven. Jesus knew what they had come for, but He knew what was more important. He knew that spiritual healing was more important than physical healing. A lot of people come to Jesus for things that they think are important. They want help with their depression. They want help from God with their finances. They want God to give them a job. They want God to give them healing. They want God to help with their marriage. They want God to give them direction about life. There is nothing wrong with these things, but Jesus knows that there is something more important than any of these. Though we all want a variety of things from God, Jesus knows that what we really need is the forgiveness of sins. It is useless to give a man who is dying of cancer a band-aid for a sore thumb. But that is all we are doing if we help people with their physical wants, but do not bring them Jesus to have Him cure their deepest spiritual need. This paralyzed man was brought to Jesus to get healed of paralysis. But Jesus gave him something much better – the forgiveness of sins. This is why salvation is from the top down. God is most concerned with your head than he is with your body. Does he want to heal you of sickness and diseases? Certainly. But even more important than that, He wants to deliver you from your sin. And that come by faith alone in Christ alone. Jesus would rather say, “Your sins are forgiven you” than “Your sickness is removed from you.” He may heal you, or He may not, but the most important thing you must determine is whether you are forgiven. And the forgiveness of sins comes only from the top down. It only comes from Jesus Christ, Who is the Lord of the universe, Who is the Head of the church, Who is the Savior of the world, Who is the Forgiver of sins, Who is God come in the flesh. Jesus forgives this man, and He wants to forgive you too. He forgives this man on the basis of faith alone. It’s not that the man had lived a pretty good life. It’s not that he was a funny guy and made people laugh. It’s not that he was going to turn his life around and live for God from this point onward. He simply and only believed in Jesus Christ for eternal life. And that is how you and I get eternal life also. By believing in Jesus for it. God gives eternal life to anyone who places faith in Christ. Have you done that? Has Jesus looked at your faith and said to you, “You sins are forgiven you”? If not, make sure that you believe in Him today, and He will forgive your sins. The man came hoping to be healed, but he got something much better than that. Of course, many people were shocked and offended by what Jesus says here. The owner of the house is offended that someone ruined his roof, and he wants the men to pay for it, but Jesus tells the man he is forgiven? How can he do that? It’s not Jesus’ roof that was ruined. Those who are most shocked are the Pharisees. They stare at him wide-eyed. Many of them gasp. They finally received the answer they were looking for, but they didn’t expect to receive it so clearly. They came trying to figure out what kind of teacher Jesus was, and now He has plainly told them. In their minds, He is a blasphemous teacher. This is the sentence they pronounce upon him in Luke 5:21. The Pharisees correctly understood the claim that Jesus was making. They came to find out who Jesus was, and He has given them their answer. By forgiving the mans sins, Jesus was saying, “I am God.” And so the scribes and Pharisees condemn Jesus as a blasphemer. They are correct in saying that only God can forgive sins. You see, ultimately, all sin is sin against God. Sure, we sin against our spouses, and against out neighbors and against are parents. And when we sin against them, they can forgive us of that sin. But that sin is also a sin against God, and we must be forgiven by God as well. But imagine what a shock it would be if someone comes a steals your car, and when the culprit is caught, I went to them and said, “Don’t worry about it. I forgive you.” You would say, “Hey! It’s not your place to forgive. This guy sinned against me, not against you, and so you can’t forgive him. Only I can if I choose to.” But that is essentially what Jesus is doing here. He is forgiving this paralyzed man of his sins when it is not his place to forgive…unless He is God. And that is what the Pharisees say here. Who can forgive sins but God alone? They are aware of Psalm 103:12 which teaches that it is God who forgives sin. They are thinking, “Jesus is speaking blasphemy! He are claiming to be God!” This is the sentence they pronounce upon Him, and look how Jesus responds in Luke 5:22-24. Anyone can claim to forgive sins. Anyone can say, “Your sins are forgiven.” And it is impossible from our human perspective to know if they are forgiven or not. Forgiveness of sins is invisible. So Jesus sets out to prove that He has the authority to forgive sins. He sets out to prove that He is God. To show them all that He has power on earth to forgive sins, He tells the paralyzed man to get up, take his bed, and go home. You see, if Jesus had truly blasphemed God, God would not perform this miracle through Him. If Jesus had commanded the healing, and the healing did not happen, everybody would have known that He was a fraud, an imposter, a fake, a false teacher. But if Jesus truly was who He said He was, then this miracle would happen, and Jesus would prove that He was God come in the flesh. And of course, in Luke 5:25, the paralyzed man received sensation in his arms and legs. Luke 5:25. Immediately he rose up before them, took up what he had been lying on, and departed to his own house, glorifying God. Immediately, the man is healed. This healing proved that identity of Jesus. He is not just a man. He is not just a teacher. He is not just a prophet. He is God come in the flesh. 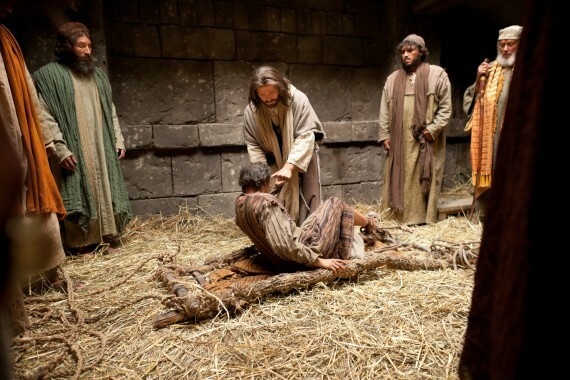 He has the authority to forgive sins, and He proved it by healing the paralyzed man. And now the man, with feeling in his arms and legs and toes and fingers, goes home, glorifying God. How could he not glorify God after what had happened to him. Not only was he freed from paralyses, but he was freed from the greater burden of sin. Paralysis kept him from moving, but sin had him chained to death. Now he was free from both. Now, he had both physical and spiritual sensitivity. And because of it all, he glorified God. And look at the response of the crowd in Luke 5:26. Look what they said about this event. There are always mixed responses to Christ’s teachings and miracles. This time is no different. Everybody is amazed, and they glorify God, but at the same time, they are filled with fear and keep on saying that they have seen strange things. The truth is they don’t know quite how to react. The Pharisees and teaches of the law eventually conclude that Jesus is not God, but is instead using the power of the devil to perform miracles. Some of the people believe in Jesus for eternal life. Some of them just follow him a round for a while seeking for more healings and miracles. Some of them turn on Jesus and side with the religious rulers. What is your response to Jesus? Who do you say that He is? Is He God come in the flesh, or is He just some man with good morals and teachings? And if you believe that He is God, have you believed in Him for eternal life? Have you trusted in Him alone for the forgiveness of sins? There is no other way to have your sins forgiven. The most important thing about who Jesus is, is that He is God. 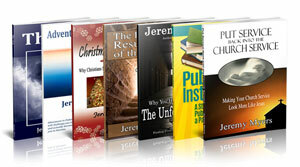 The writer of Hebrews tells us that that the only way we can have our sins forgiven is if God himself dies for them (Heb. 10). And that is exactly what Jesus, the God-man, came to do. If Jesus was just a man, if Jesus was a just a teacher, we are yet in our sins, and there is no way we can get to heaven. But thanks be to Jesus Christ, for through Him, because He is God, we have the forgiveness of sins (Col 1:13-14; Rom 7:25; Acts 10:43; Matt 26:28). You are right. The Gospel of John contains some of the clearest texts in the 4 Gospels on the divinity of Jesus. John 1 does stand out among the 4 Gospels, and I agree the Bible is Christocentric.